Dogs are the best companions of human beings, But sometimes the dog is very naughty -- running to the road, jumping on family members and guests, pulling on the leash during walks, chewing, barking or ignoring your pleas to come back? From our experience working with many breeds, we offer a timely, effective and dog-friendly dog training collars help your dog to correct Barking, Walking, Leash Training, Sitting, Aggression, and other Behavioral Obedience. Flashlight light on the receiver: With the flashlight on the receiver, you can easily find your dogs in low brightness environment with this remote shock collar for dogs..
What This Dog Shock Collar Can Do: There are four modes of work in this electric dog collar with remote: beep, vibration, shock with levels 1-99 for progressive behavioral obedience, and to be able to shine in a dark environment to find your dog. Remote Control with LCD Display Screen: The LCD display screen shows what you are doing and the remaining electricity. Each button on the remote controller corresponds to one function, and the remote control design is simple and clear and the control distance is the farthest up to 2500ft. With this dog training collar with remote, you can easily train your dog in the park or backyard. Rechargeable simultaneously：The remote controller and receiver have built-in rechargeable lithium battery, and the general USB charging line can charge the remote controller and receiver at the same time. 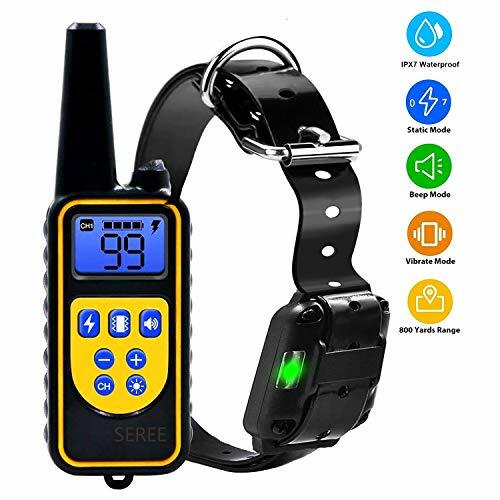 After 2-hour fully charging, this pet trainer shock collar is able to work for several days, the dog collar shock 3-6 days, and the remote 6-12 days. 30-day money back warranty, 1-year warranty by YISENCE. Your Satisfaction is the most important to us . If you have any concerns or worries please do not hesitate to contact us "YISENCE Tech"and we will get back to you within 1 business day. If there is a quality problem with this small dog shock collar with remote we will replace the affected product or refund you. If you have any questions about this product by YISENCE, contact us by completing and submitting the form below. If you are looking for a specif part number, please include it with your message.